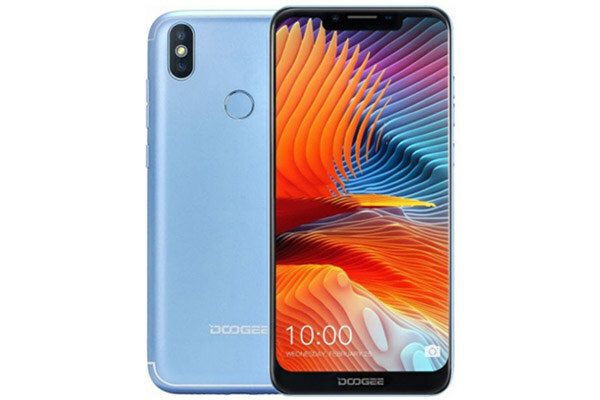 Holding up the notch design is another smartphone from the Chinese OEM – Doogee. At a time, the notch was a buzz and although, trendiness of the notch design has died down, it’s still finds its way to recent smartphones. This time around, Doogee picked up the interesting design, added a 5,500mAh battery and other cool features and produced the Doogee BL5500 Lite. More details will unfold as we progress. With the notch’s on board, the supposed impact is that there’ll be enough screen estate to play with. But before we go into the screen talk, there’s the Xiaomi My A2 Lite look on this smartphone. The colours black and gold are interesting colour options but the blue sets the tone for a more flashy appearance. Whatever the colour iteration may be, the smartphone is dolled up with a triple camera setup – two at the rear and one in the notch. A fingerprint reader, located at the back, provides touch ID authentication. Meanwhile, the hugeness of the 6.19-inch screen together with the 19:9 ratio and HD+ resolution means viewing pleasure is verified at the price. For a user that needs a smartphone with power that can last for a day and beyond, the Doogee BL5500 Lite is there to answer. Interestingly, if the phone isn’t heavily used, the 5,500mAh battery can carry a user beyond the 36 hours lifespan. Different camera modes can be accessed on the phone as a result of its camera astuteness. One of the most interesting among them is the portrait mode in which the rear’s secondary 8MP shooter provides enough background detail for the main 13MP sensor. On the flip side, a 5MP camera tends to the affairs of selfies. More like the regular, the MediaTek MT6739 SoC is at the heart of Doogee BL5500 Lite. It holds a Quad-core CPU that speeds up to 1.5GHz and PowerVR GE8100 GPU. Its multitasking actions are simplified by a 2GB RAM. Android Oreo and Doogee UI is found laid over the operating system. Finally, files are stored on the expandable 16GB internal storage. The smartphone is available for about 36, 000 Naira depending on the deal and your location.